BMX rider Mat Olson scales the arches of the West Seventh Street Bridge in Fort Worth, Texas, Jan. 11, 2014. Mat Olson didn't want to use the bike lane. 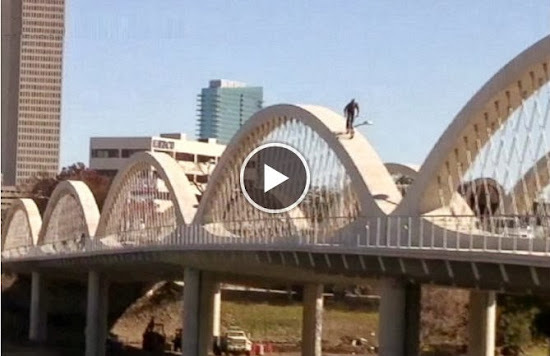 So the BMX rider scaled the arches of a Fort Worth, Texas, bridge Saturday, pedaling along a strip of concrete less than 5 feet wide. No guard rails, no net. It took Olson just moments to traverse the West Seventh Street Bridge's six arches, calling it an "amazing feeling to be up that high." Cars drove across the bridge below as he completed the trip. Olson's friends watched nearby, shooting video of their friend's extreme adventure. Someone else was also watching: a police officer. "He looked a little mad," Olson said. "I think he was more astonished. "I think he was more amazed I was alive than anything and gave me a stiff warning to not try this again." After the stunt, city officials placed bags of concrete and wooden barriers to stop copycats. As for Olson, he says he's just thankful he crossed the bridge unscathed. web site taste is great, the articles is in reality excellent : D.